I walked along the hallway, backstage of the arena. Dean walked by me. "I&apos;m going to go the divas locker room," I told Dean. I stopped, "I&apos;ll be fine." "Not after what the Wyatts did to you," Dean said. I sighed, "Dean, it&apos;s not that far, I&apos;ll be fine." He scratched the back of his neck, "I just want to make sure you&apos;re ok, if anything like that happened to you again...."
"I know, but I think you need to go talk to Seth and Roman." Dean looked at me with confusion, "Why?" "Just how you disappeared from the match." Dean rolled his eyes, "They don&apos;t believe me." "It&apos;s not that," I promised, "Just...... I&apos;ll see you. I don&apos;t want to have fear to walk around back here." Dean nodded, "Alright, love you." "I love you," he kissed me on the cheek after seeing that no one was around before leaving me there. I made it to the locker room without any problems. I opened the door. "Gabby!" Brie ran to me and gave me a hug. "Sorry," Brie pulled away, "Are you OK?" Nikki, Eva, Nattie, and Cameron came over. "Your eye doesn&apos;t look to good," Cameron commented, pointing at my black eye. "That&apos;s not the worse part," I pulled my shirt off, revealing my black sports bra. "What was that from?" Nattie asked. "A wall," I answered as I opened my suitcase and pulled my shield gear out. I pulled on a hounds of justice shirt that covered the bruises. Brie patted my back, "How long till you can compete again?" "Whenever I want," I paused, "But maybe I should wait a week or so." "Are you still coming to Cabo after Smackdown?" Nikki suddenly said. "That&apos;s the last thing we should be worried about," Brie said. "But seriously, Gabby, are you still coming?" I snorted, "Yeah, I&apos;m coming." "I can&apos;t wait," Nikki clapped. 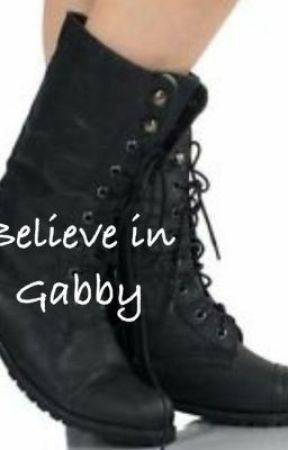 I changed into my black pants and black combat boots before leaving them and walking to the guys locker room. "Ok, lets talk through this again, where were you last night?" Seth asked. Roman stood by him as they looked at Dean. "I&apos;ve been repeating myself for the past twenty four hours and quite frankly, I&apos;m getting a little sick of you two ganging up on me!" Dean yelled. I walked into the locker room just as Dean finished. I walked over, "Guys, whats...."
"We&apos;re not gaining up on you..." Seth argued, ignoring me. "And I&apos;m getting a little sick of having to explain myself, so if you two don&apos;t believe me. If you two don&apos;t trust me, whatever. I&apos;m done," Dean walked away.